You have claimed your barcodes in Arctos and ordered or printed them, now you are ready to open a freezer and start using Arctos to track your specimens. This document includes a workflow which you may need to modify slightly depending upon how the information for what is in your freezer boxes is currently stored and whether or not you purchased or printed duplicate barcodes. If you have already set up your freezer, now is the time to move the new freezer box to the correct location in Arctos. If this is not the case, you can perform these steps later when your freezer has been set up. You are now ready to barcode the cryovials. 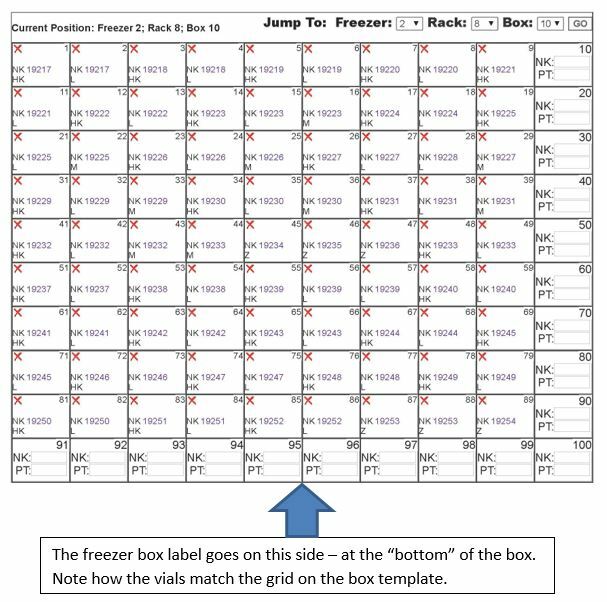 At MSB, we have the information for each freezer box in an Excel sheet. 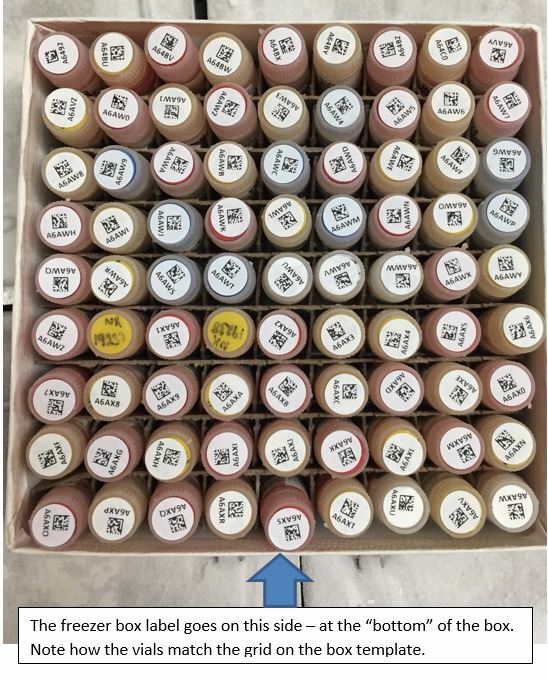 We use this sheet to record the position of each cryovial in the freezer box, the type of identifier used to match the sample with a specimen, the catalog or other identifier number that matches the sample in the vial with a specimen, the tissue that is in the cryovial, and the barcode that is placed on the cryovial. This spreadsheet can be used later to create custom labels for the cryovials and to associate the barcodes with the appropriate specimen parts in bulk rather than one-by-one. Pull the box out of the freezer and place it in a cooler with ice packs frozen at the same temperature as the freezer from which your freezer box was removed for barcoding. At MSB we stress that the box of tissues must always be on ice and if the tissues have been out too long (more than 30 minutes), we ask students to put the box away and allow it to re-cool for an hour. We also use gloves and/or tweezers to reduce handling and warming of the vials. At MSB we organize all freezer boxes with position 1 in the top left corner of the box, with the first row containing position 1 through 9 or 10 and position 10 or 11 resides just below position 1 depending upon whether the box is 9x9 or 10x10. The barcoding process follows this pattern as well. Refreshing the freezer box “map” will allow you to see what has been scanned into the box. When you are finished barcoding all of the vials, refresh the freezer box “map” to be sure that the virtual box in Arctos matches the physical box.